Hunter College was established in 1870 as part of New York City’s public university system. It was located on the Upper East Side of New York City. The Bronx campus (now known as Lehman College) first opened in the 1930s; by this time Hunter had locations in Brooklyn, Queens and Staten Island as well. 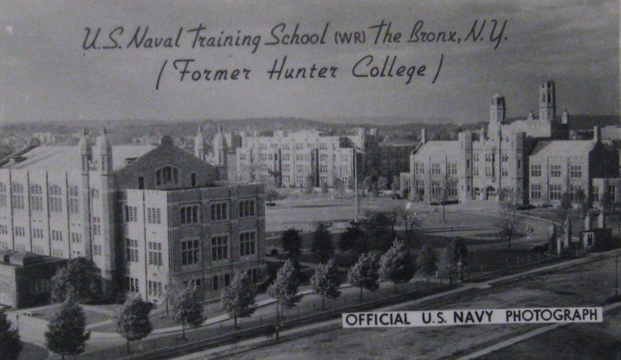 The Bronx campus remained under Navy jurisdiction until 1945. Then it briefly housed the United Nations, before being returned to the Hunter College system in 1946. Hunter was the women’s college of the system through the 1950s. The Bronx campus was one of the first to go co-educational, and the entire system allowed women by 1964, The Bronx campus was renamed Lehman College in 1968. This photograph comes from a postcard booklet designed for WAVES recruits to send it home to their parents, families and friends. It shows the Hunter College training station. It is from the Betty H. Carter Women Veterans Historical Project at the University of North Carolina Greensboro.